Tacos can be the most satisfying meal for me. I like the fact that in each small bundle there’s an abundance of flavour and textures in each bite. I like that they are small enough that you can order a few different kinds adding to the variety of a meal, and I love that they’re a hand-food. I’ve had a lot of great tacos in Mexico and California until recently, there hasn’t been a lot of options in Vancouver for a great taco. The blossoming food truck scene in Vancouver has added to the variety, but from what I’ve tried so far, those are mainly serving fusion-tacos. Where to go when you’re craving something more “authentic”? 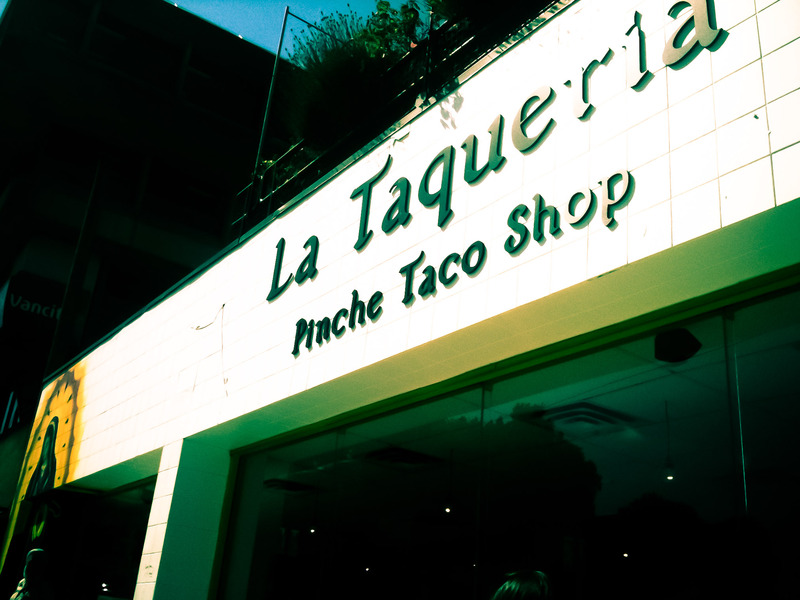 La Taqueria on Cambie St is the clone of the original location on West Hastings, (that I’ve never been to). I’d driven by this place a few times in the past and it’s always had a line out the door. I was skeptically curious, as there’s nothing more disappointing to me than wasting a meal on a bad taco. But a friend said that it was somewhere I had to check out, so within a few days I was there. The line out the door moved quickly and gave me time to decide from their wall of choices.I knew I was going to choose 4 for $9.50 but everything looked so good, I had a hard time narrowing it down. Luckily, my lunch partner and I strategized over our choices so we’d get a good sampling of the menu. 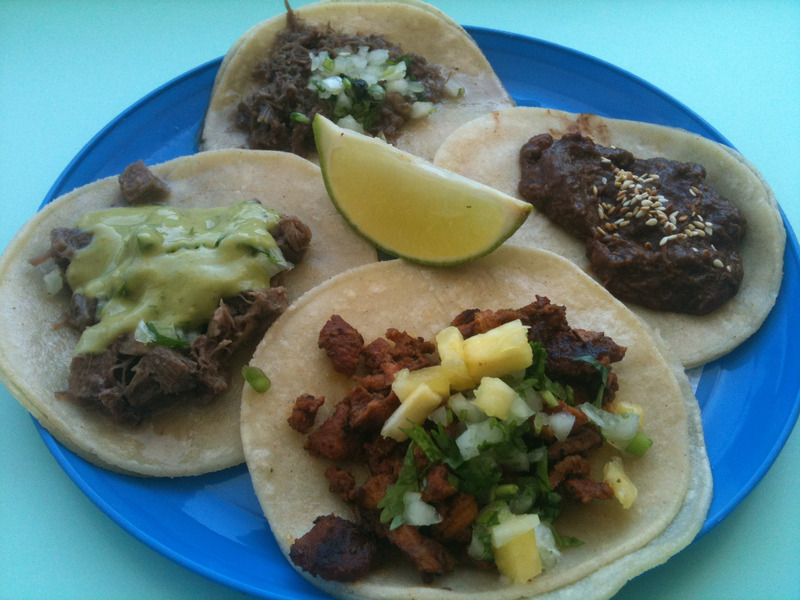 Clockwise from 12:00 – DE CACHETE(beef cheeks), TPOLLO CON MOLE (chicken in chocolate mole sauce), AL PASTOR (pork marinated in achiote chili and pineapple), DE LENGUA (beef tongue). The verdict? These tacos are good. I preferred the vegetarian ones over the meat ones as I felt both the corn and the mushrooms had flavour while the meat ones, (minus the mole) all could have used a bit more seasoning. 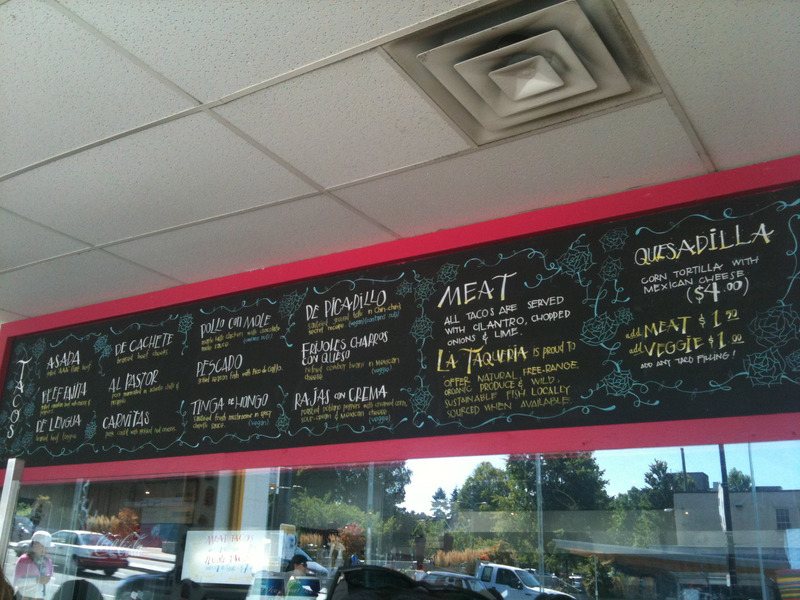 Even with the variety of salsas and pickled vegetables you could add on top, they just seemed to be one note short. 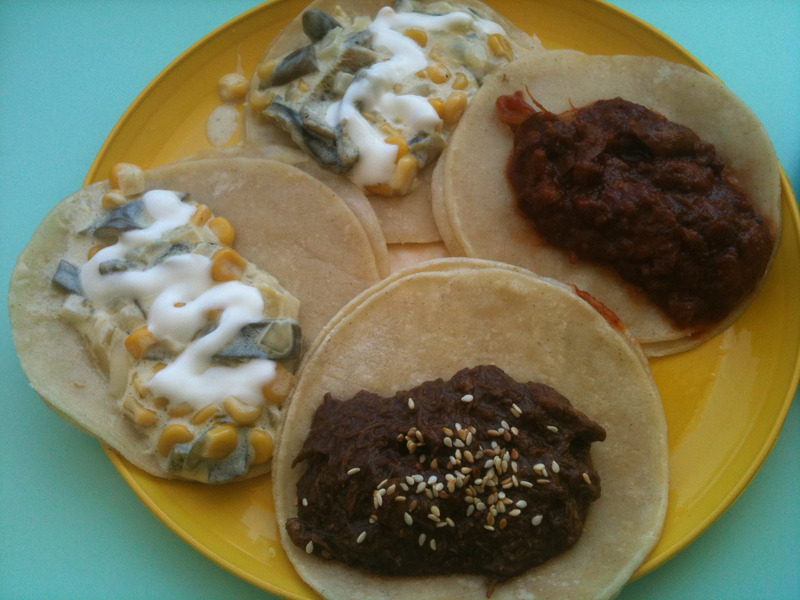 The chicken mole was my favourite meat taco, albeit a bit sweet. But I’m spoiled when it comes to moles and have very high standards. All in all, a very good taco, and Vancouver’s lucky to have it. I can’t wait to go back to try the rest of the menu.